I’ve already had an earlier post about the crazy genius Bill Veeck in this blog’s youth, and I expect to have a few more. This was probably one of his better promotions, which seemed to get a little crazier as he got older. Veeck made the Cleveland Indians a quick success after becoming owner of the club in 1946 (first AL black player, Larry Doby, in 1947, and a championship in 1948), but it would be short-lived; after getting divorced in 1949, he had to sell the Tribe to fund the settlement, but wouldn’t stay on the sidelines for long. Veeck remarried in 1951, and then promptly purchased 80% ownership in the St. Louis Browns. The Browns would be a tough test for the budding marketing whiz, as the Cardinals shared the same park, and were far more popular. His first moves were to hire legendary Cardinals Rogers Hornsby (as manager) and Dizzy Dean (as an announcer), although Veeck fired Hornsby by June. 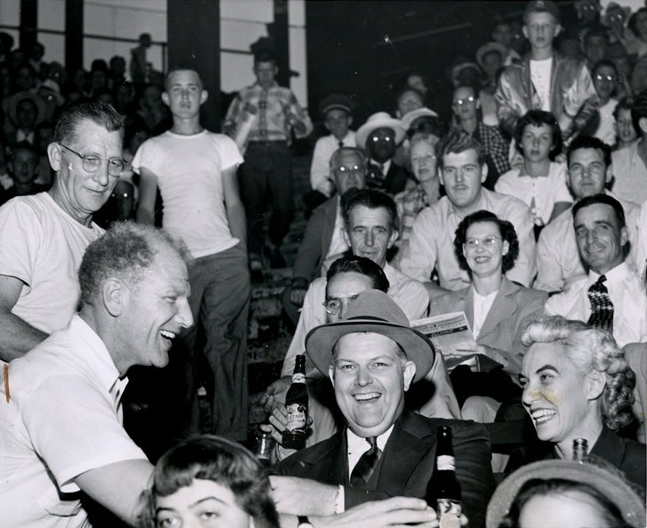 Thinking of more ideas to get fans into the ballpark, Veeck held a “Drink On The House” Night at Sportsman’s, July 1951. In a press photo below, Veeck is seen himself passing out free brews to the surprised Browns’ faithful. Somehow, I can’t imagine Fred Wilpon coming down the aisle at Citi Field to hand me a free Brooklyn Lager any time soon. It was actually a good way to get the word out about one of the local beer sponsors, Falstaff, St. Louis’ own. 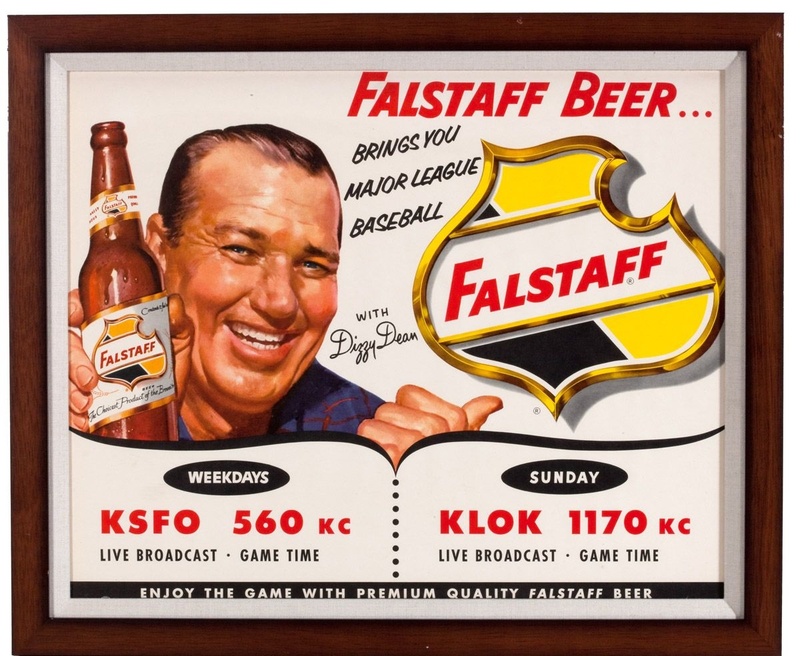 Below, a Falstaff beer ad with ol’ Diz. Either way, it seems to have worked out better than future Veeck promotions, which grew increasingly unusual. Only a month later was the famous Eddie Gaedel game, in which Veeck used the services of a “little person” to go up for an at-bat for the Browns (he walked). Unfortunately, Veeck’s grandstanding would have little effect, and he himself would be largely responsible for the demise of the St. Louis Browns. When beer giant Anheuser-Busch purchased the Cardinals in 1952, with endless resources, Veeck knew the writing was on the wall, and looked to bidders to move the franchise. Milwaukee was the first choice, but the Boston Braves beat them to it, so the next choice was Baltimore – and Veeck planned on remaining majority owner, but the other owners were not very keen on it, and voted him down, so he sold the team anyway, and the Orioles were born. Veeck would go on to bring success to the Chicago White Sox (during two tenures), but also more unusual ideas, both good and bad, including introducing the famous exploding scoreboard in Comiskey Park and putting players’ names on their uniforms for the first time, both in 1960, and later the infamous “shorts” uniform from the 1970’s, the beginning of Harry Caray (then White Sox announcer) singing Take Me Out To The Ball Game, and last but not least, Disco Demolition Night in 1979, in which disco records were blown up on the field, and resulted in a near riot and the forfeit of the second game of a doubleheader by the White Sox. Veeck finally sold the White Sox in 1981 and retired from baseball, passing away in 1986. He is responsible for many of the craziest things that have happened on a baseball field, and I’d have to admit, baseball history would be a lot less interesting without him. Just finished reading the most recent biography on Veeck. Truly a fascinating man who, whether one loved or hated him, kept baseball very interesting for a long time. Agreed. And he actually had more success with various franchises than most folks remember. Thanks for commenting.